Omelets bring everything you love about breakfast into one place: Eggs, cheese, meat, vegetables. What’s better than that? To truly experience a delicious omelet, one must visit South Carolina—where we’re serving up some of the most hearty and scrumptious in the country. Get up and at ‘em at these 10 great places to grab an omelet in the Palmetto State! 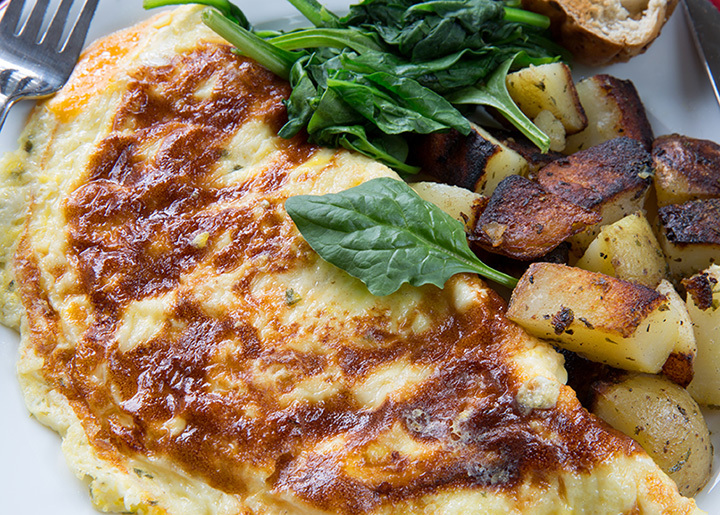 Specializing in all things egg-related, it’s no wonder Le Peep has crafted hall of fame-worthy omelets. You can choose from one of their classic concoctions, like the meat lovers’ Omni Omelet, or create your own with a selection of meats, veggies and sauces sure to please your taste buds. It’s not completely dedicated to the omelet genre, but this little cafe knows how to make a good one. This farm-to-table eatery gives you a chance to experience what a fresh omelet should taste like by sourcing local ingredients for all their dishes, including the chef omelet. Lowcountry cooking meets the omelet at this breakfast house. They aren’t a mecca for all things omelets, sure, but their South Carolina omelet gives you a taste of everything Lowcountry cooking should taste like: lump crab meat, Carolina shrimp, and jack cheese garnished with lobster cream sauce and plated with home fries. What’s a brunch menu without an omelet? Here you’ll find an upscale assortment of omelets (among many other tasty breakfast options), including the lobster and brie omelet, the crab meat-based Floridian omelet, and the avocado and chorizo Hey Lucy! omelet. Greenville’s lucky to boast the only South Carolina location of this small restaurant chain. Chickadee’s knows omelets. That’s why they’ve got a huge portion of their menu dedicated to eggs-traordinary omelet creations. They feature a range of meats like spicy sausage, Philly-style steak, NYC pastrami, and smoked ham, along with a variety of veggies, cheeses and other toppings (ever tried Texas chili in an omelet?). They may be a pancake house, but their Carolina omelet is a definite food gem that deserves equal attention. Along with tasty breakfast treats, guests rave about the friendly service and ambiance that deviates from many of the other pancake houses in the area. Here’s you’ll find a fun variety of omelets that cover the flavor gamut pretty well. Order a classic cheese or vegetarian omelets if you aren’t feeling too adventurous. Or try the Florentine or spicy Southwest Omelette for an extra flavor burst. If you can make up your mind, the Trash Can Omelette is your best bet—it packs a heaping variety of toppings. Every bit as good as your grandma’s cooking, Country Omelet knows their way around a breakfast menu. They feature an extensive menu for any time of day, full of fan favorites like chicken tenders, steak, pork chops, and all the trimmings. They also aren’t afraid to offer items that satisfy even the most oddball tastes (frog legs and eggs, anyone?). If there’s one thing Myrtle Beach locals and tourists know, it’s that you can find a good breakfast at the many pancake houses dotting the area. What they don’t realize is that Pan America Pancake & Omelet House also serves up tasty omelets (it’s in their name, but not on their sign). This family-friendly breakfast joint is known for its consistent food quality, friendly service, and very reasonable prices. Martha’s Market Place Cafe is just like eating at home, except you don’t have to do all the cooking and cleanup. Their omelets are nothing short of perfection. You can also expect a high level of friendly, personalized service.